Are you defining faith the same way Richard Dawkins does or the way Jesus does? - Is Jesus Alive? There’s this really annoying thing that I see many atheists do. Not to overgeneralize, but I’ve heard it far too often. And it’s that they will persist in defining faith as belief without evidence. There’s also this thing annoying thing I see Christians do. And it’s that they’ll basically agree with the atheist. That guy sure had a way with words. You’ll see similar sentiments echoed these days, even on church signs. Blind faith or biblical faith? 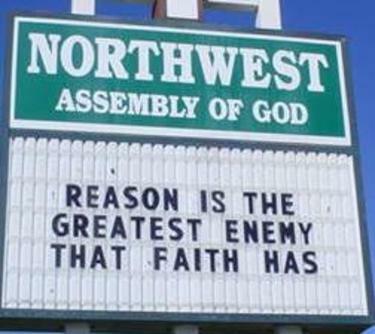 Here’s the problem: This notion of faith just ain’t biblical. Faith isn’t believing without evidence. Faith is accepting the evidence you have as true and living accordingly. Yes, he did. But never read a bible verse in isolation to its context. Think about it for a second. And he also already heard Jesus predict his own death and resurrection. (John 2:18-21) Or so John tells us. Furthermore, he heard about the empty tomb from people he knew very well. His friends had already reported that they had seen the risen Jesus. Jesus wasn’t saying we’re blessed if we have blind faith. Jesus was chiding Thomas’ stubborn refusal to believe the evidence he already had. This is also the same gospel that Jesus refers to his miracles as proof of his divine claims. Jesus wasn’t asking anyone to just believe blindly. He didn’t say that faith was a leap in the dark. Jesus was saying have faith in the evidence he was providing through the miracles. He just expected Thomas to believe the testimony of others. Because there was a good reason to do so. There still is good evidence today. It’s what this site outside the blog is all about. Seen with our eyes. Looked at. Handled with our own two hands. Does this sound like “believing what you know ain’t so?” Can we please lay to rest this silly strawman? Defining faith the way you wish is an easy way to take a cheap shot. It might score some rhetorical points. Christians have all too often accepted the definition their opponents have given. But faith is not a choice made in spite of the evidence but in response to it. And unbelief would be to close your eyes to it. Many did in Jesus’ day. Going back to John one last time: “Though he had done so many signs before them, they still did not believe in him.” (John 12:37) The evidence can stare you in the face and you can still explain it away if you want to. Therefore, don’t let someone knows nothing about faith tell you what faith is for you. Jesus and John didn’t define faith this way. Neither should anyone else.